I don’t know why I expected anything else but sugar and sweet from a fragrance put out with Hello Kitty’s name on it. Or expect anything from a perfume that comes out of a cartoon cat’s head. But hey, it’s just fun. In Bottle: Sweet, candy, and quite synthetic smelling. There’s not much to this perfume aside from candy-like with a little touch of apple and other fruits to cut the tedium a little. Applied: Initial flare of sweet fruit with an apple note that’s very synthetic. This is the apple that I smell in DKNY Be Delicious. Too sweet, a little plastic, not very attractive but it does its job as a fruity opener. The fragrance heads into its mid-stage with an equally sweet showing, amping up the sugar even more while it takes on a bit of a vanilla and fruity flowers mix. There’s no really good florals in this, just vague perfumery flower scent that smells as nondescript as the rest of the fragrance. The dry down is a typical sweet vanilla with a cleaned up white musk finisher. Extra: Hello Kitty’s had a few perfumes named after her over the years but I believe this one is a part of the Hello Kitty beauty line that’s now available at Sephora. I never quite understood the Hello Kitty craze, though I do own a few pieces of Sanrio merchandise and remember a vague time in my tween years when I thought some of the characters were cute. I can appreciate this for the fun factor at least. Design: The bottle is essentially Hello Kitty’s head with a balloon pump coming up the top. It’s cute at first glance but when you settle down and think about it, it’s a bit macabre. Here you have Hello Kitty, with a sprayer nozzle coming out of her head, and then you squeeze a balloon pump to get the cartoon happiness out of the bottle. The balloon pump, being what it is, is not as good as a standard push atomizer but it is functional. I would be concerned about how the balloon pump continues to function as the user uses the perfume more and more as it’s a pretty delicate piece of hardware. Notes: Cassis sorbet, mandarin, apple, magnolia blossom, freesia, orange flower, tonka bean, vanilla, musk. And now I know what Hello Kitty is supposed to smell like. This fragrance lived up to my expectations of it smelling like a candy confection. If you’re looking for complex and interesting, you’d have better luck elsewhere. 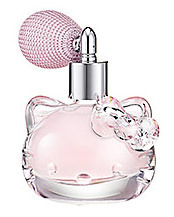 Reviewed in This Post: Hello Kitty, 2011, Eau de Parfum. This entry was posted in fruity, Reviews By House, spin off, sweet and tagged apple, cassis sorbet, freesia, magnolia blossom, mandarin, musk, orange flower, tonka bean, vanilla. Bookmark the permalink.